There is a big wave in outer space that is nearly twice the size of the Milky Way. (All right, it’s massive, let’s call it a tsunami.) A team of scientists recently discovered the formation in the nearby Perseus cluster after combining data from the Chandra X-ray Observatory, radio observations, and computer simulations. It may not be safe to surf but it is truly a sight to behold. The tsunami likely formed billions of years ago when a much smaller galaxy cluster passed through Perseus, which is one one of the biggest objects in the known universe. The collisions between the two objects created what is called a Kelvin-Helmholtz wave, which is essentially the same sort of wave we see on Earth when the wind hits water. The difference is this wave is huge — galaxy clusters are already the largest gravity-bound structures we know of. At 11 million light years across, Perseus is one of the biggest of them all. NASA's Goddard Space Flight Center/Stephen Walker et al. NASA’s Goddard Space Flight Center/Stephen Walker et al. 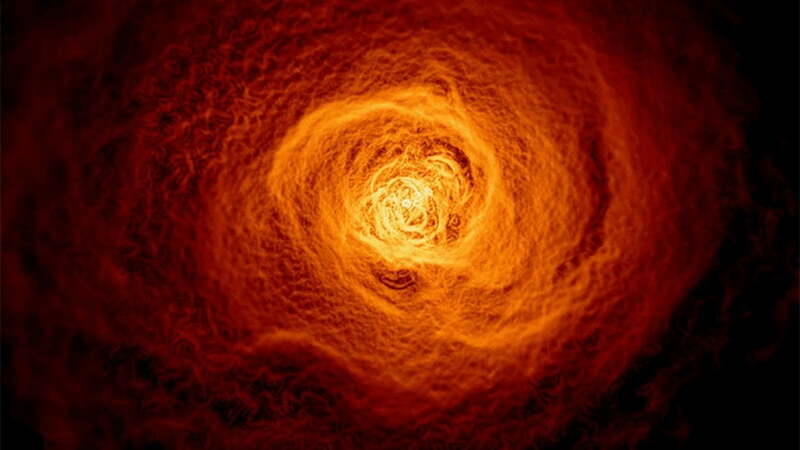 Perseus is not only massive, it is immensely hot. Most of the cluster’s detectable matter is gas that burns at tens of millions of degrees. This particular wave, which the researchers think is the largest ever discovered, was spotted in a “bay” of the cluster near the bottom left corner of the image above. A computer simulation demonstrated that a passing galaxy cluster could have disrupted Perseus in such a way to create this striking formation billions of years ago. The wave itself may spend hundreds of millions of years rolling along the edge of the cluster. The discovery will help scientists better understand the origin and formation of these structures, which offer hints into the history of the universe itself. A paper detailing the study was published in the journal Monthly Notices of the Royal Astronomical Society.